A 16th-century castle, Château Les Oliviers de Salettes sits in a 5-hectare park just 20 km from Montélimar Train Station. It offers an outdoor swimming pool, terrace, garden, restaurant and smoking lounge. The air-conditioned rooms at Château Les Oliviers de Salettes - Châteaux et Hôtels Collection feature a flat-screen TV with cable channels, a view of the mountains or park, and a private bathroom. A breakfast is available daily at an extra cost, and the restaurant serves traditional French cuisine. The Château also has a bar. Château Les Oliviers de Salettes - Châteaux et Hôtels Collection features a spa and hot tub, which are available with a supplement, and guests can rent electric bike and vintage cars. Free WiFi and free private parking are provided on site, and the A7 motorway is 14 km from the property. With mountains or park views, the air-conditioned suites are set in the castle and feature a flat-screen TV and a private bathroom with a bath tub or shower, or a bath tub and a shower. 1 Junior Suites has a private balcony overlooking the mountains. The suite features a private, furnished terrace at the top of one of the castle towers with panoramic mountains or park views. It has 2 private lounges, a dining area, a separate bedroom for children and 2 flat-screen TVs. The private bathroom has 2 cast iron bath tubs, 1 shower and separate toilet. These deluxe double rooms have either a park or mountain view. Two of the rooms are located into the outbuilding, the 6 other rooms are situated in the castle. Three of them are cooled only by a cooling floor, whilst the other rooms are fully air-conditioned. All feature a flat-screen TV and a private bathroom with a bath tub and/or shower. These classic double rooms have either a view of the park or the mountains. One of the rooms is located in the castle, while the others are located in the castle outbuilding. The air-conditioned rooms feature a flat-screen TV, and a private bathroom with a shower. These suites have a view of either the park or the mountains. Each is air-conditioned and features 2 flat-screen TVs and a private bathroom with a bath tub or a shower. 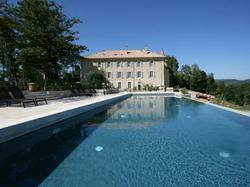 One of the suites is located in the castle outbuilding and boasts a panoramic terrace.